LAGOS—THE Lagos State Alliance for Democracy, AD, governorship candidate, HIGH Chief Owolabi Salis has said the coming election is the opportunity for Lagosians to speak up for a true megacity and governance based on welfare for all across ethnic, religious and political divides. 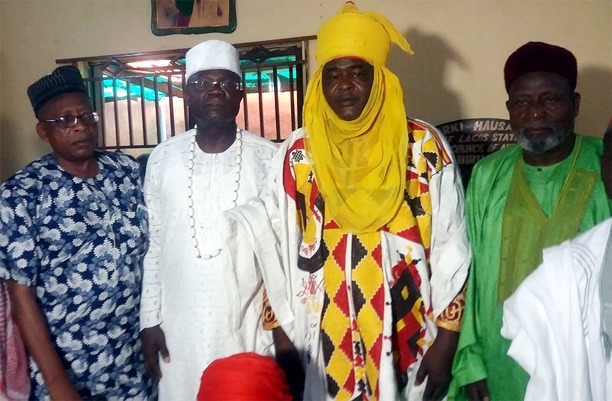 From left— Alliance for Democracy Lagos State Chairman, Mr. Kola Ajayi; AD, Lagos State governorship candidate, High Chief Owolabi Salis; Sarki Hausa, Lagos State, and Chairman, Council of Arewa Chiefs, HRH Alhaji Kabiru Garba, and his Vice, Shua Arab, Sultan Jibrin Yahaha, during Salis’ campaign visit to Alhaji Garba’s palace in Lagos. Salis said this in Lagos during campaign tours to the palace of Sarki Hausa, Lagos State, and Chairman, Council of Arewa Chiefs, Alhaji Kabiru Garba; Sierra Leone Nationals Association in Nigeria, led by Mr. Fanday Bayoh, and market leaders and traders association of Nigeria in Lagos State and its President, Christopher Opara. Salis said: “For Lagos to be a true megacity there must be freedom and security. A megacity never sleeps. But insecurity, encouraged by selfish politicians that put guns in the hands of youths, has taken over the state.